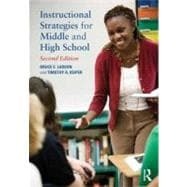 Instructional Strategies for Middle and High Schoolis an accessible, practical, and engaging methods textbook that introduces pre-service teachers to various instructional strategies and helps them to decide how and when to use these methods in the classroom. Classrooms are comprised of diverse learners, and aspiring teachers will face complex decisions about the assessment of student learning and classroom management. Veteran teacher educators Bruce Larson and Timothy Keiper offer practical suggestions for ways to integrate effective classroom management and valid assessment techniques with eachinstructional strategy. Instructional Strategies for Middle and High Schoolequips pre-service teachers with the methodological tools to promote understanding, conceptual awareness, and learning for every child in the classroom. Features and updates to this new edition include: Clear, step-by-step descriptions and illustrative in-class videos of seven instructional techniques and that pre-service teachers can realistically implement within the classroom setting Increased coverage on teaching English language learners, including a "Making Your Lesson More Meaningful for ELLs" feature now included in every instructional strategy chapter "Enhancing Your Teaching With Technology" feature included in every instructional strategy chapter Fresh interior design to better highlight pedagogical elements and key features, all to better engage students Fully revamped and comprehensive companion website, with both student and instructor materials that stress real-world application of strategies, classroom assessment and management.